Paul Frederic Simon (born October 13, 1941) is an American musician, actor and singer-songwriter. Simon's fame, influence, and commercial success began as part of the duo Simon & Garfunkel, formed in 1964 with musical partner Art Garfunkel. Simon wrote nearly all of the pair's songs, including three that reached No. 1 on the U.S. singles charts: "The Sound of Silence", "Mrs. Robinson", and "Bridge Over Troubled Water". The duo split up in 1970 at the height of their popularity, and Simon began a successful solo career as a guitarist and singer-songwriter, recording three highly acclaimed albums over the next five years. In 1986, he released Graceland, an album inspired by South African township music. Simon also wrote and starred in the film One-Trick Pony (1980) and co-wrote the Broadway musical The Capeman (1998) with the poet Derek Walcott. Simon's musical career began after meeting Art Garfunkel when they were both 11. They performed in a production of Alice in Wonderland for their sixth grade graduation, and began singing together when they were 13, occasionally performing at school dances. Their idols were the Everly Brothers, whom they imitated in their use of close two-part harmony. Simon also developed an interest in jazz, folk and blues, especially in musical legends Woody Guthrie and Lead Belly. Between 1957 and 1964, Simon wrote, recorded, and released more than 30 songs, occasionally reuniting with Garfunkel as Tom & Jerry for some singles, including "Our Song" and "That's My Story". Most of the songs Simon recorded during that time were performed alone or with musicians other than Garfunkel. They were released on several minor record labels, such as Amy, Big, Hunt, King, Tribute, and Madison. He used several pseudonyms for these recordings, including Jerry Landis, Paul Kane and True Taylor. Simon enjoyed some moderate success in recording a few singles as part of a group called Tico and the Triumphs, including a song called "Motorcycle" that reached No. 97 on the Billboard charts in 1962. Tico and the Triumphs released four 45s. Marty Cooper, known as Tico, sang lead on several of these releases. A childhood friend, Bobby Susser, children's songwriter, record producer, and performer, co-produced the Tico 45s with Simon. That year, Simon reached No. 99 on the pop charts as Jerry Landis with the novelty song "The Lone Teen Ranger." Both chart singles were released on Amy Records. The pair reunited six years later in New Orleans at the New Orleans Jazz & Heritage Festival. Simon's next project was the pop-folk album, There Goes Rhymin' Simon, released in May 1973. It contained some of his most popular and polished recordings. The lead single, "Kodachrome," was a No. 2 hit in America, and the follow-up, the gospel-flavored "Loves Me Like a Rock" was even bigger, topping the Cashbox charts. Other songs, like the weary "American Tune" or the melancholic "Something So Right" —a tribute to Simon's first wife, Peggy— which received an Grammy Award nomination for Best Song of the Year. Both songs became standards in the musician's catalogue. Critical and commercial reception for this second album was even stronger than for his debut. At the time, reviewers noted how the songs were fresh and unworried on the surface, while still exploring socially and politically conscious themes on a deeper level. The album reached No. 1 on the Cashbox album charts. As a souvenir for the tour that came next, in 1974 it was released as a live album, Live Rhymin', which was moderately successful and displayed some changes in Simon's music style, adopting world and religious music. After three back-to-back successful studio albums, Simon became less productive during the second half of the 1970s. He dabbled in various projects, including writing music for the film Shampoo, which became the music for the song "Silent Eyes" on the "Still Crazy" album, and acting (he was cast as Tony Lacey in Woody Allen's film Annie Hall). He achieved another hit in this decade, with the lead single of his 1977 compilation, Greatest Hits, Etc., "Slip Slidin' Away," reaching No. 5 in the United States. As he commented years later, after the disappointing commercial performance of Hearts and Bones, Simon felt he had lost his inspiration to a point of no return, and that his commercial fortunes were unlikely to change. While driving his car in late 1984 in this state of frustration, Simon listened to a cassette of the Boyoyo Boys' instrumental "Gumboots: Accordion Jive Volume II" which had been lent to him by Heidi Berg, a singer songwriter he was working with at the time. Lorne Michaels had introduced Paul to Heidi when Heidi was working as the bandleader for Lorne's "The New Show". Interested by the unusual sound, he wrote lyrics to the number, which he sang over a re-recording of the song. It was the first composition of a new musical project that became the celebrated album Graceland, an eclectic mixture of musical styles including pop, a cappella, isicathamiya, rock, and mbaqanga. Simon felt that he had nothing to lose. He went to South Africa in an attempt to embrace the culture and find the most comfortable environment for recording the album. Sessions in Johannesburg took place in February 1985. Overdubbing and additional recording was done in April 1986, in New York. The sessions featured many South African musicians and groups, particularly Ladysmith Black Mambazo. Simon also collaborated with several American artists, singing a memorable duet with Linda Ronstadt in "Under African Skies," and playing with Los Lobos in "All Around the World or The Myth of the Fingerprints." Warner Bros. Records had serious doubts about releasing an album of this eclecticism to the mainstream, but when it did in August 1986, Graceland was praised by critics and the public, and became Simon's most successful solo album. Slowly climbing the worldwide charts, it reached #1 in many countries, including the UK, Canada, Australia, and New Zealand—and peaked at #3 in the U.S. It was the second-best-selling album of 1987 in the US, selling five million copies and eventually reaching 5x Platinum certification. Another seven million copies sold internationally, making it his best-selling album. Much of the success of the album was due to the lead single, the upbeat "You Can Call Me Al," whose lyrics describe a man experiencing an identity crisis. The track featured many memorable elements—a catchy synthesizer riff (played by Adrian Belew of King Crimson], an easy whistle solo, and an unusual bass run, in which the second half was a reversed recording of the first half. "You Can Call Me Al" was accompanied by a humorous video featuring actor Chevy Chase, which introduced Simon to a new audience through MTV. In the end, the track reached UK Top 5 and the U.S. Top 25. Further singles, including the title track, "The Boy in the Bubble" and "Diamonds on the Soles of Her Shoes," were not commercial hits but became radio standards and were highly praised. After Unplugged, Simon's place in the forefront of popular music dropped notably. A Simon & Garfunkel reunion took place in September 1993, and in another attempt to capitalize on the occasion, Columbia released Paul Simon 1964/1993 in September, a three-disc compilation that received a reduced version on the two-disc album The Paul Simon Anthology one month later. In 1995 he made news for appearing at The Oprah Winfrey Show, where he performed the song "Ten Years," which he composed specially for the tenth anniversary of the show. Also that year, he was featured on the Annie Lennox version of his 1973 song "Something So Right," which appeared briefly on the UK Top 50 once it was released as a single in November. Surprise was a commercial hit, reaching #14 in the Billboard 200 and #4 in the UK. Most critics also praised the album, and many of them called it a real "comeback" for the artist. Stephen Thomas Erlewine from Allmusic paid attention to the attempts of Simon in embracing his classic folk sound with Eno's electronic textures, and wrote that "Simon doesn't achieve his comeback by reconnecting with the sound and spirit of his classic work; he has achieved it by being as restless and ambitious as he was at his popular and creative peak, which makes Surprise all the more remarkable." The album was supported with the successful Surprise Tour. Simon is one of a small number of performers who are named as the copyright owner on their recordings (most records have the recording company as the named owner of the recording). This noteworthy development was spearheaded by the Bee Gees after their successful $200 million lawsuit against RSO Records, which remains the largest successful lawsuit against a record company by an artist or group. All of Simon's solo recordings, including those originally issued by Columbia Records, are currently distributed by Sony Records' Legacy Recordings unit. His albums were issued by Warner Music until mid-2010. In mid-2010, Simon moved his catalog of solo work from Warner Bros. Records to Sony/Columbia Records  where Simon and Garfunkel's catalog is. Simon's back catalog of solo recordings would be marketed by Sony Music's Legacy Recordings unit. On June 5, 2012 Simon released a 25th anniversary box set of Graceland, which included a remastered edition of the original album, the documentary film Under African Skies, the original 1987 "African Concert" from Zimbabwe, an audio narrative "The Story of 'Graceland'" as told by Paul Simon, and other interviews and paraphernalia. He played a few concerts in Europe with the original musicians to commemorate the anniversary. In February 2014, Simon embarked on the On Stage Together Tour with English musician Sting, playing 21 concerts in North America. The tour will continue in early 2015, with ten shows in Australia and New Zealand and 23 concerts in Europe, ending on 18 April 2015. In an in-depth interview reprinted in American Songwriter, Simon discusses the craft of songwriting with music journalist Tom Moon. In the interview, Simon explains the basic themes in his songwriting: love, family, social commentary, etc., as well as the overarching messages of religion, spirituality, and God in his lyrics. Simon goes on in the interview to explain the process of how he goes about writing songs, "The music always precedes the words. The words often come from the sound of the music and eventually evolve into coherent thoughts. Or incoherent thoughts. Rhythm plays a crucial part in the lyric-making as well. It’s like a puzzle to find the right words to express what the music is saying." In 1978, Simon made a cameo in the movie, The Rutles: All You Need Is Cash. Simon has appeared on Thanksgiving Day episode of SNL (November 20, 1976). The two performed "Here Comes the Sun" and "Homeward Bound" together, while Simon performed "50 Ways to Leave Your Lover" solo earlier in the show. On that episode, Simon opened the show performing "Still Crazy After All These Years" in a turkey outfit, since Thanksgiving was the following week. About halfway through the song, Simon tells the band to stop playing because of his embarrassment. After giving a frustrating speech to the audience, he leaves the stage, backed by applause. Lorne Michaels positively greets him backstage, but Simon is still upset, yelling at him because of the humiliating turkey outfit. This is one of SNL '​s most played sketches. Simon has won 12 Grammy Awards (one of them a Lifetime Achievement Award) and five Grammy nominations, the most recent for his album You're the One in 2001. In 1998 he received a Grammy Hall of Fame Award for the Simon & Garfunkel album Bridge Over Troubled Water. He received an Oscar nomination for the song "Father and Daughter" in 2002. He is also a two-time inductee into the Rock and Roll Hall of Fame; as a solo artist in 2001, and in 1990 as half of Simon & Garfunkel. In 2007, Simon received the first annual Ira Gershwin, this new award recognizes the profound and positive effect of popular music on the world’s culture. On being notified of the honor, Simon said, “I am grateful to be the recipient of the Gershwin Prize and doubly honored to be the first. I look forward to spending an evening in the company of artists I admire at the award ceremony in May. I can think of a few who have expressed my words and music far better than I. I’m excited at the prospect of that happening again. It’s a songwriter’s dream come true." Among the performers who paid tribute to Simon were Stevie Wonder, Alison Krauss, Jerry Douglas, Lyle Lovett, James Taylor, Dianne Reeves, Marc Anthony, Yolanda Adams, and Ladysmith Black Mambazo. 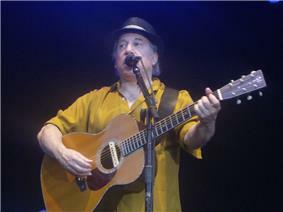 The event was professionally filmed and broadcast and is now available as Paul Simon and Friends. When Simon moved to England in 1964, he met Kathleen Mary "Kathy" Chitty (born 1947) on April 12, 1964, at the first English folk club he played, The Hermit Club in Brentwood, Essex, where Chitty worked part-time selling tickets. She was 17, he was 22, and they fell in love. Later that year they visited the U.S. together, touring around mainly by bus. Kathy returned to England on her own with Simon returning to her some weeks later. When Simon returned to the U.S. with the growing success of "The Sound of Silence", Kathy, who was quite shy wanted no part of the success and fame that awaited Simon and they split. She is mentioned by name in at least two of his songs: "Kathy's Song" and "America," and is referred to in "Homeward Bound" and "The Late Great Johnny Ace." There is a photo of Simon and Kathy on the cover of The Paul Simon Songbook. His third wife is folk singer Edie Brickell whom he married on May 30, 1992. They have three children: Adrian, Lulu, and Gabriel. Simon is a proponent of music education for children. In 1970, after recording his "Bridge Over Troubled Water," at the invitation of the NYU's Tisch School of the Arts, Simon held auditions for a young songwriter's workshop. Advertised in the Village Voice, the auditions brought hundreds of hopefuls to perform for Simon. Among the six teenage songwriters Simon selected for tutelage were Melissa Manchester, Tommy Mandel and rock/beat poet Joe Linus, with Maggie and Terre Roche (the Roche Sisters), who later sang back-up for Simon, joining the workshop in progress through an impromptu appearance. Simon invited the six teens to experience recording at Columbia studios with engineer Roy Halee at the board. During these sessions, Bob Dylan was downstairs recording the album Self-Portrait, which included a version of Simon's "The Boxer". Violinist Isaac Stern also visited the group with a CBS film crew, speaking to the young musicians about lyrics and music after Joe Linus performed his song "Circus Lion" for Stern. Manchester later paid homage to Simon, on her recorded song, "Ode to Paul." Other younger musicians Simon has mentored include Nick Laird-Clowes, who later co-founded the band The Dream Academy. Laird-Clowes has credited Simon with helping to shape the band's biggest hit, "Life in a Northern Town". In 2003, Simon signed on as an official supporter of Little Kids Rock, a nonprofit organization that provides free musical instruments and free lessons to children in public schools throughout the U.S. He sits on the organization's board of directors as an honorary member. Bronson, Fred (2003). The Billboard Book of Number 1 Hits. Billboard Books. ^ "Episodes: Paul Simon". American Masters. ^ Ruhlmann, William. "Paul Simon: Biography". ^ a b "Biography and Timeline: Paul Simon". Inductees. 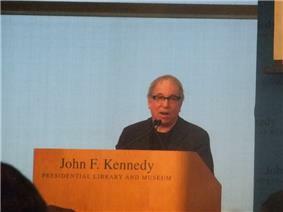 ^ "Paul Simon: The Library of Congress Gershwin Prize for Popular Song". ^ "Board of Trustees". Retrieved May 17, 2012. ^ "The open Paul Simon biography". paul-simon.info. 2012-10-29. ^ "Notable Alumni". Alpha Epsilon Pi. Retrieved 23 January 2014. ^ "Simon & Garfunkel – Kraft Music Hall 1968 Part 2 of 3‏". YouTube. January 3, 1968. Retrieved July 15, 2011. ^ "Paul Simon News on Yahoo! Music". Music.yahoo.com. July 31, 2004. Archived from the original on June 4, 2011. Retrieved July 15, 2011. ^ "whizzo.ca". whizzo.ca. Retrieved October 15, 2011. 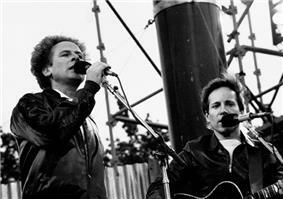 ^ "Bob Dylan and Paul Simon: A mismatch made in heaven? by Seth Rogovoy". Berkshireweb.com. Retrieved July 15, 2011. ^ """Includes complete recording of "Getting Ready for Christmas Day. Oldweirdamerica.wordpress.com. November 6, 2010. Retrieved July 15, 2011. ^ Shanahan, Mark; Goldstein, Beth (February 26, 2012). "Leonard Cohen and Chuck Berry celebrated at the JFK Library". The Boston Globe. Retrieved March 1, 2012. ^ "Berklee Board of Trustees". Retrieved May 17, 2012. ^ "Paul Simon's Graceland – official website". Retrieved Feb 9, 2013. ^ """Paul Simon Looks Back on the Anniversary of the Amazing "Graceland. Retrieved 9 February 2013. ^ Paddock, Barry; Marcius, Chelsia Rose; Siemaszko, Corky (December 19, 2012). "Paul Simon sings at funeral of Sandy Hook heroine teacher Victoria Leigh Soto as Newtown lays to rest another hero school staffer and four slain students". 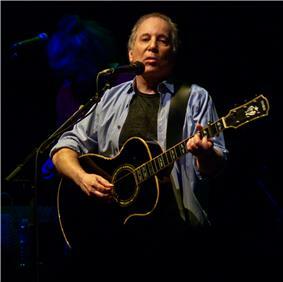 ^ "Interview: Paul Simon Discusses Songwriter And Songwriting". ^ Brantley, Ben (18 August 2010). Capeman' Outdoors, Starring the City"'". The New York Times. Retrieved 24 November 2014. ^ "Paul Simon : Polar Music Prize". ^ Miller, Michael (April 13, 2012). "Carrie Fisher: Self-acceptance run wild". ^ "at". Theacf.com. Retrieved July 15, 2011. ^ "Mobile health units bring medical care to homeless". Lubbockonline.com. Retrieved July 15, 2011. ^ "Paul Simon photograph". Media.npr.org. Retrieved 2014-05-07. ^ "Paul Simon promotions". Eil.com. Retrieved 2014-05-07. Kingston, Victoria (1996). Simon and Garfunkel: the definitive biography. London: Sidgwick & Jackson. p. 308. Marilyn Bergman, Alan Bergman & Marvin Hamlisch - "The Way We Were"